attention, interpretation, appraisal, beliefs, memories, conditioning, attitudes and affect”. I just call it listening to your body. and heed our bodies’ messages, the healthier we become in all ways. the present moment nonjudgmentally”. Mindfulness can increase your health and wellbeing. the primary “holder” of past trauma, emotional issues and psychological issues. meditation programs show moderate evidence of improving anxiety and depression. (mindfulness-based therapy for insomnia, or MBTI), or a self-monitoring program. health program that includes physical activity, education about diet, and music therapy. This entry was posted in Application, Healing, Intuition on 14 March , 2017 by Pamela Dussault. The question I get asked most regarding the REAP Healing Method is “how is it different from Reiki?”. REAP, which is an acronym for Remote Energetic Alignment Process, does have similarities to other forms of energy medicine such as Reiki. Yet like each of the various energy healing modalities it has distinct differences in how energy is harnessed and transmitted to the client. Moreover, how the client experiences their healing process has significant distinctiveness as well. As a Usui Reiki Master Teacher, I am intimately familiar with the subtle nuances of Reiki. In fact, I still enjoy giving and receiving it from time to time. The REAP Healing Method was, in a sense, born from Reiki as well as from Shamanic Energy Healing and a technique called Body Activation. I love each method and in time found myself blending them into one. I also added the use of my intuition and empathic abilities into the mix. My knowledge and training in massage therapy and the various body systems has provided a body-based foundation for the REAP Healing Method. Additionally, my familiarity with other forms of energy healing through my ongoing studies (such as Polarity and Traditional Chinese Medicine) have had an influence on the birth of REAP, albeit minimal. Obtains healing energy through “Activation” of one or more physical organs or systems of the body Obtains healing energy through “Universal Life Force”. Healing is targeted in one or more of 11 areas of the body which extends outward into energy field (formal structure). Healing is targeted anywhere in or around the body (no formal structure). Use of intuition and empathy plays a pivotal role in administering the healing. Intuition has no role and empathy is discouraged. Healing is “sent” through a process called “Magnetic Resonance” in which your body’s innate God-given intelligence is utilized. 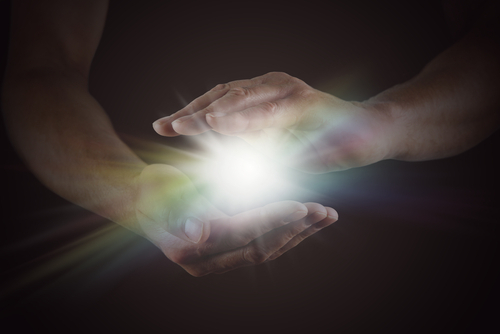 Healing is sent through the hands using “Universal Life Force” energy. Advanced level uses “Activation” to correct distorted mental and emotional patterns and imprints in the energy field, along with restoring DNA and wholeness of soul. Advanced levels use symbols to correct mental and emotional patterns. The client is often given intuitive information about the origin or cause of the problem and are often given “homework” after the healing session to empower them in the process (and further their healing, growth and expansion of wholeness). The client may or may not receive intuitive information about the origin or cause of the problem or receive homework. This provision of intuitive information is generally not encouraged nor is this kind of training provided. These are some of the significant differences between REAP and Reiki. This comparison is intended to provide an understanding and is not to disparage the use of Reiki. If you are unsure about which method is best to use or learn, I always recommend one should rely on accumulated practical information, study and most importantly to follow what resonates most with you. This entry was posted in Healing on 8 March , 2016 by Pamela Dussault. Shamans over many centuries, have operated under the basic truth that all power comes from within. Spiritual teachers, leaders and healers from around the world have different names for this – the higher self, the core self, Source, the spirit, the I AM Presence, and many more. Regardless of what name it is given, this inner power refers to what is most true about you. It refers to the fact that each one of us is innately connected to a far more powerful source of creation. This connection ensures that we have the ability to do just about anything we can conceive of and believe in – especially including healing. For instance, it is well known that our physical bodies have infinite intelligence as a result of this power within. If you think about it, there are millions of tasks that our bodies perform every day to keep us alive – all without any action on our part. You may wonder then, why are we sometimes riddled with unhealthy conditions or illness, feel depleted or just plain sick? The answer lies in today’s culture where there is too much emphasis placed on cognitive activity and production. Another way of saying this is we become extremists trying to keep up with the demands life presents us and neglect our intrinsic need to lovingly nurture and care for our growing body, mind and spirit. This inadequate attention results in imbalances of our entire systems – physical, emotional, mental and spiritual – which then results in poor health and ill-being. However, good news lies ahead. Because of this power within, we can turn these conditions around. This inner power allows you to focus your energy and attention to empower, strengthen and activate your health and well-being – or if you choose – the health and well-being of another. The REAP healing method teaches you how to harness this inner power and apply it to the exact locations on the body that restore your balance, health and well-being. Additionally, you’ll find that by learning the REAP healing method, your connection to a far greater Source within you and around you will be activated and strengthened – bringing about a greater sense of clarity, purpose and understanding about your own infinite nature. I invite you to learn this healing method and join our growing community of practitioners. The learning experience that REAP provides, is enlightening and profound for students at any level. This entry was posted in Healing on 23 April , 2015 by Pamela Dussault. The mission of the REAP Healing Method is to follow the divine purpose of globally planting the seeds of healing in order abundantly expand our growth and higher alignment to unite us all, and our planet, in love and light.